There can be more than 1,000 seeds in a pomegranate! Are you taller than a pomegranate tree? A pomegranate tree can grow up to 15 feet in height and live for as long as 100 years! 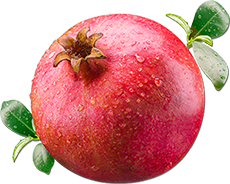 The Hindus perceive the pomegranate as a symbol of fertility and prosperity. Many believe that Adam was tempted by a pomegranate and not an apple. It is one of the oldest fruits known to man. A glass of pomegranate juice is sweet yet it contains less than one gram of protein and fat.